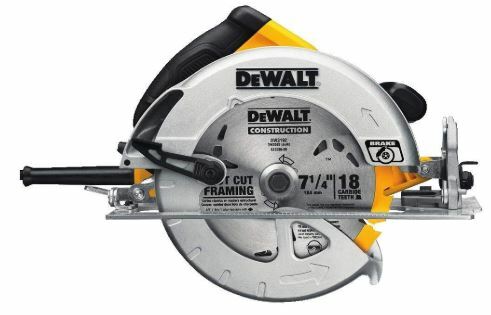 5 Best Circular Saw Reviews- Which One Should You Buy? A circular saw is the main power cutting tool for many woodworkers, homeowners, and construction professionals. This type of saw is the tool of choice for a quick cutting job. It has a quick setup, few adjustments, and can turn a pile of lumber into precisely fitted parts for a project or home improvement. Choosing the Best Circular Saw is not easy; there are a lot of good tools on the market. These handy models have a wide range of power levels, and with new battery advances, cordless machines compete with corded models. This reviews will provide some information, advice, and insights on getting the top tool and the best value. This model is a medium-priced tool, and it is made to last a lifetime. The Makita 5007MGA has advanced safety built-in with lights, a solid Magnesium foot, and an automatic blade brake to stop the spinning blade when the trigger is off. The model 5007MGA is easy to set for quick, accurate cuts. With an assortment of blades, it can tackle nearly any type of material from concrete, PVC, hardwood, to soft metals. 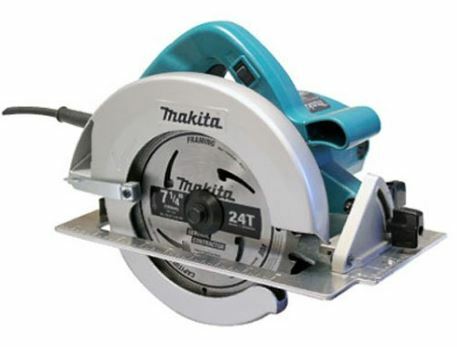 The Makita has a powerful 15-amp motor with direct drive and the traditional sidewinder style. For overall power, durability, accuracy, safety, and performance, the Makita 5007MGA Magnesium is the best choice. When considering the uses for your electric power tool, you should remember your preferences. Some users need extra light in the cutting area, a laser to help follow a line, or guides to get a straight sight cut. A puff of air to clear the dust can make work go better, and one should always think in terms of safety, comfort, and control. These items come as features in the models we review here and depending on their importance, you should weigh them carefully. The advances in lithium-ion batteries have added a range of choices to the power tool. If you regularly work in cramped conditions or areas without access to electric plugs, then a battery powered model should be on your list. You should consider the power rating for the machine and the per charge runtime of the battery. Cordless tools are great until they run out of power. The price of a second battery can rival the price of the machine itself in some models. Batteries may require some maintenance, a point not always clear in the handling instructions from manufacturers. For example, a winter of non-use in a seasonal user can mean the battery will not regain its charge. You should carefully read and follow care instructions for the machine and the batteries. The Makita 5007F has outstanding features and a design that offers strength and durability. This machine works well for the homeowner, woodworker, and building professional because it is versatile and easy to use. At 11 pounds, you can easily handle it with one or two hands, and work all day comfortably. The motor is made to last, as it has a cooling system that helps reduce heat buildups. The machine stays cooler and resists wear due to the effects of heat on moving parts. The Makita 5007F is a user-friendly machine. The trigger and safety lock require no special movement and work with either left or right hand on the control. For many conditions, light and vision over the cutting area is a concern. Accurate and safe operation depends on precision and a clear line of sight. The features include two bright LED lights to light the target area and the path ahead. The machine clears the path with a jet of air to brush away sawdust and keep the cutting line view clear during the cut. The Makita 5007F handles bevels up to 45 degrees in the thick wood, and it adjusts easily with a well-marked tilt gauge. 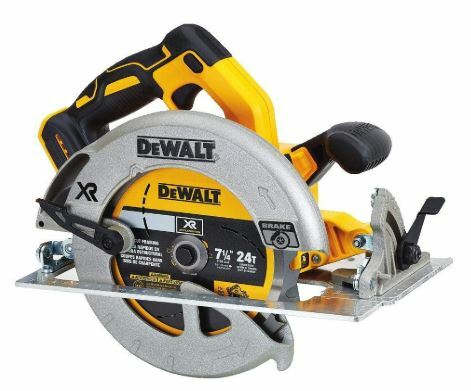 It has a powerful motor that spins the blade at 5800 rpm that allows the blade to slice through all types of wood and compressed board materials. You can add specialized blades and work just as easily in plastics like PVC pipe, brick, concrete, and metals. The safety features are excellent. Safe cuts are easier when the shoe is firm and holds its shape over years of usage. The strong aluminum frame and foot move easily over surfaces without too much bending. Other models with steel foot can bend over time and reduce the accuracy of cuts. The flat firm foot provides a long-lasting solid base for safe and secure operations. The DEWALT 5WE575 SB is a hard-wearing machine that is easy to operate. It is ideal for powered locations and for users of all levels of experience. 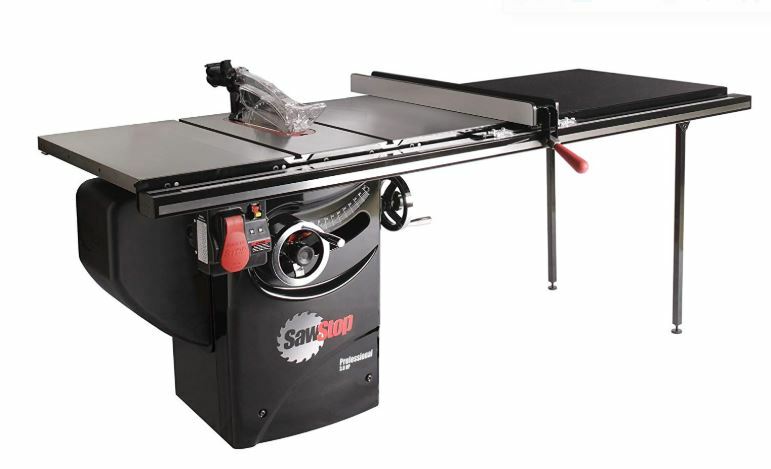 The mid-range price point puts it in the range of the serious hobbyist, woodworker, and building professional. This corded DEWALT model has superior engineering and design that minimizes heat buildups and protects internal gears and moving parts. The maker designed the machine to take heavy wear, provide precise cuts, and last for many years. The powerful motor yields 1950 Maximum Watts Out, and the blade spins at 5100 rpm. It has a compact design, as the cross width is only 7.7 inches which allows greater ease in tight quarters. The lighter weight and comfortable trigger help users work in comfort and for long periods as they plow through a home project or job site task. The machine weighs 8.8 LBS., and it is one of the lightest machines in its class. It has an impressive depth of cut at 2.56 inches, and a zero to 57-degree bevel range. It can handle all kinds of materials in addition to wood, hardwood, and compressed wood products. You can add bladed for concrete, masonry, PVC-type plastics, and metals. It has a safety brake to slow and stop the spinning blade as soon as the user releases the trigger. This is of value when doing a high volume of repetitive cuts. The spinning blade requires care, and the automatic brake improves safe operation for the user and others. The solid foot and frame help keep cuts straight. The machine uses aluminum stamped metal alloys in the foot, and it will not bend or reshape over time. The machine has an automatic air jet that clears dust away from the cutting path. Cuts are safer and more accurate when sawdust does not cover the surface. This 6.5-inch power saw offers convenient cordless operation, light handling weight, and safety features. It is an ideal option for those that need cordless power, and the freedom of operating a tool without the constraint of a power cord. The powerful generation of Lithium-Ion batteries, the flexibility of cordless operation no longer requires a big sacrifice in operation power. 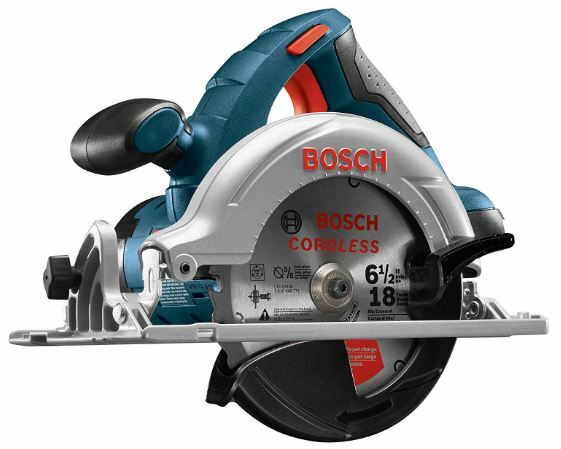 This cordless lightweight Bosch model will power through tough materials. The Bosch CCS180B weighs only 6.7 lbs. It generates a blade speed of 3900 rpm with no load. You can easily operate it for long periods using one or two hands as needed for control and precision. The rear-view depth adjustment helps keep the blade tip close to the surface on through cuts and offers excellent control for grooves and lines. The safety features include an electric brake and an anti-snag lip on the lower blade guard. The machine starts a cut smoothly by easing onto the cutting surface. The spindle locks for easy blade changes with the convenient on-board wrenches. The machine accepts finer edged blades for finished wood cutting, and tough tips for hard surfaces. The depth adjustment gauge adjusts with one hand, and it has a convenient lever lock. The Bosch CCS180B offers up to 50 degrees in bevel angle cuts. It works well with PVC, plastics, metals, and masonry. The smaller blade offers better control for precision cuts and trims. Portable and flexible operations are major advantages of cordless models. You will not have to look out for the location and limits of the power cord. The easier movement reduces the awkward angles and difficult positions when working on home repairs, job sites, or in the project workshop. This cordless model adds flexibility and convenience to your improvements, woodworker projects, and job site tasks. A cord can interfere with the free movement needed to work quickly and effectively. In this machine, there is no sacrifice of cutting power in exchange for losing the cord. The machine has little extras that make life easier; this model has a rafter hook built-in to the shoe. The adjustments for the depth of cut and the bevel are convenient and well-marked. A slight glance will let you see the marks for 22.5 and 45 degrees on the bevel gauge. Brushless motor technology adds efficiency to the motor performance, and the battery power goes stronger for a longer time. The smooth and quiet operation includes the all-day comfort and safety of the contoured grip and trigger. You must hold the trigger to operate the machine, and comfort is important. The DEWALT DCS570B has excellent runtime and high-level performance when crosscutting thick wood and ripping boards and sheets. The brushless technology is important for the 20v structure. The 20 v format is not as powerful as the high-end 60 v cordless; 20-volt models need to focus blade power to match the performance of corded models. The cordless saw has a built-in blade brake. This is an important safety feature and one found on most high-end models. The brake has a nearly instant stopping power. The bevel range goes from 0 to 57 degrees. The motor has 20 watts power with a 9-watt Maximum Watts Out rating. One negative besides needing a recharge; it is not rated for metal work. The blade speed at 5500 rpm provides plenty of power for the work that it can do with framing wood, trim, hardwoods, plywood sheets, and compressed wood products. This corded machine has a price point in the lower range of available power saws on the market today. It goes beyond the basics and provides a smooth operating cutting tool that will handle the work of much higher priced models. Users of all levels of experience will enjoy the laser beam guide for accurate sight cuts and following lines. It also has an air jet to blow dust and saw material away from the line of movement. By price, it is an ideal model for the hobbyist and homeowner that does not expect to run the tool heavily each day. However, the powerful motor and sturdy design will hold up well to heavy usage. It is an excellent choice for hobby and home improvement projects. The onboard storage holds the spindle wrench, and the spindle lock helps get quick blade changes. You can change easily to handle all types of wood and many materials; the machine accepts interchangeable blades for fine cuts, brick, metal, and plastics. This well-made model improved the motor power, from the previous model. It added strength to the frame and foot to make a durable, lightweight, and comfortable machine. 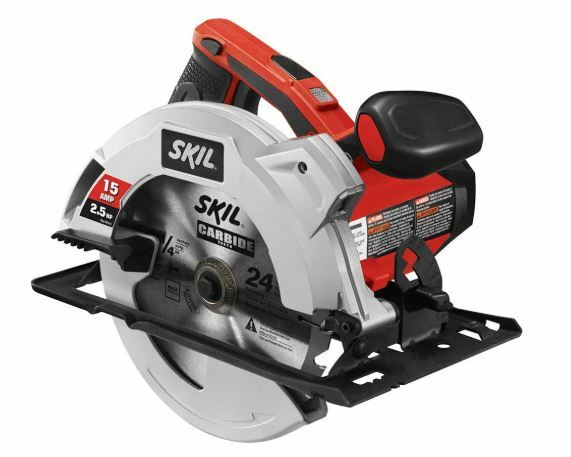 This improved model is Ideal for light duty tasks like hobby projects, home repair work, and woodworking. Homeowners will enjoy the simplicity of the machine; it does not require a lot of effort to learn to use the machine and its conveniently located features. This is a powerful, well-made, and easy to use corded electric model. Power, safety, and control are the elements that matter most in an electric power tool for users of all experience levels. While this model has the drawback of a power cord, it has a brilliant combination of motor power, balance, and protective features. The machine lights the cutting path, slices through wood and material easily, and the electronic brakes stop the blades and help prevent injury or accident. Whether you’re new or experienced, this tool will help you get the best from the time you spend cutting wood and material for projects, repairs, or tasks.